One of the nice things about the Holga 120N camera, is that it comes with a hotshoe. That makes it easy to take flash photos. It isn't always easy to determine which power setting should be used with the flash, but as with all plastic cameras, there are no hard and fast rules. 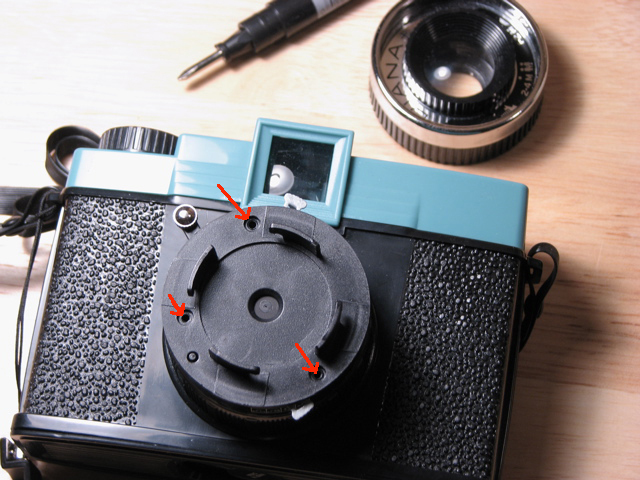 I received an email from someone who had a spring come loose from her new Diana+ and wanted to know if it was something she could fix herself. I took the opportunity to open up my Diana+ camera to see what it looked like. Photo 1 shows the location of 3 small phillips head screws that need to be removed. Photo 2 shows the location of the 2 springs. 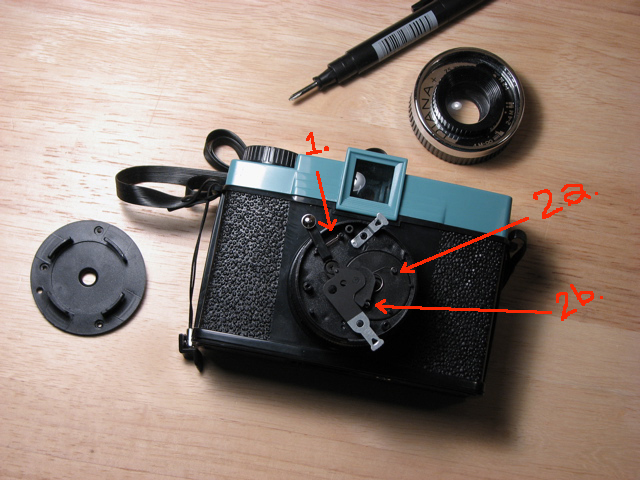 The small spring at position 1, is the shutter release return spring and it looks like it would be easy to reconnect if it were dislodged. The spring at position 2 is the shutter spring, which is a very fine wire spring connected at 2 points. This spring looks like it might be more difficult to reconnect. Point 2a connects to the shutter blade wheel. Point 2b is connected to the armature which is actuated by the shutter release. Are you having trouble getting the little bit of plastic (the Shutter Release Lock), to stay in place when you are taking a long exposure? There is a right way and a wrong way to place the lock. See the photo. The L part of the lock should be towards the body of the camera. I find that fumbling with the camera while trying to place the Lock in place can cause quite bit of wobble. If my exposure is less than 15 secs., then I just hold the shutter down. For longer exposures, I put the lens cap on (not seated all the way), and then place the shutter lock in. Then, when I'm ready, I take off the lens cap to start the exposure. To stop, a light tug on the Shutter Release Lock leash pops it out. Both have 1 shutter speed, and B (bulb) for long exposures. Diana+ has a pinhole aperture and removable lens for pinhole photographs. 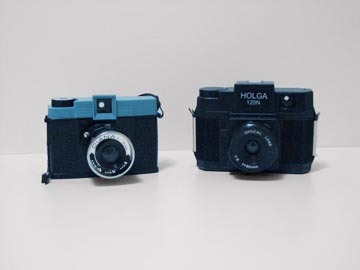 Holga has a hotshoe, Diana has no flash provision. Better lens quality? 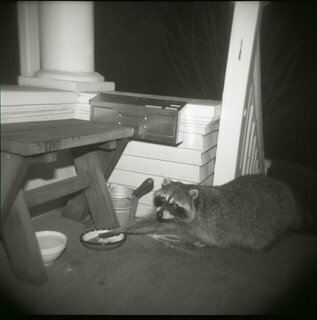 Holga camera is slightly sharper. Does this make it better? Many would argue it puts the Holga in the minus column. Diana has a handy little plastic tool to hold shutter open for long exposures. 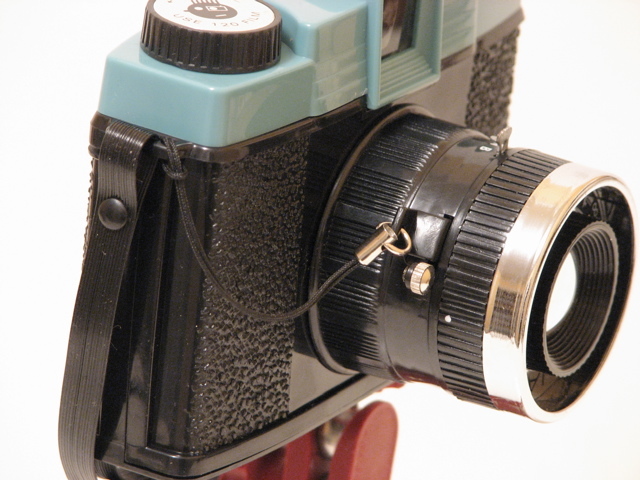 Holga does not, but you can purchase a shutter release attachment that is easier to use with a cable release. For night photography, the Holga with accessory cable release attachment has the edge. For the best of both worlds, get both! Which would I rather have with me? Jury is still out on that one, I am currently testing the Diana+, and will have a better opinion when I can compare the results of the prints.